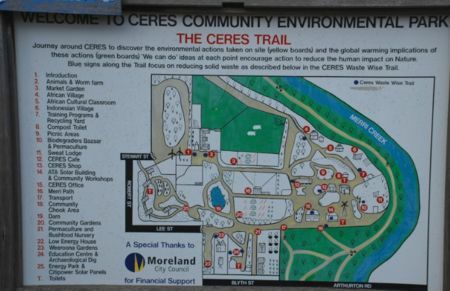 The CERES Community Environment Park is an internationally recognised model of a sustainable society located in Melbourne, Australia. CERES shares its name with the Roman Goddess for agriculture. CERES stands for the Centre for Education and Research in Environmental Strategies, and is pronounced ‘series’. 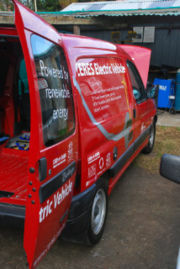 CERES is located on 4.5 hectares (10 acres) on the banks of the Merri Creek, East Brunswick, close to Melbourne’s centre. CERES runs on renewable energy, is a 55 tonne carbon sink, conserves and recycles its water and waste, grows organic food, and teaches diverse audiences about more just and environmentally friendly ways of living. Various sustainability initiatives have develope at CERES over time in a participatory social setting which has created a village-like environment. Walking around CERES today, you can enjoy a peaceful green environment with a village-atmosphere, which provides a model for a possible future, where innovation and appropriate technologies sit harmoniously in a human scale environment. CERES is engaging with 470,000 people each year about living more lightly and equitably on the planet. 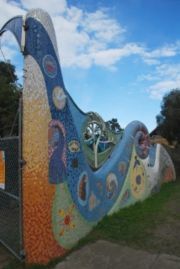 It is the most visited community environmental centre in Australia, known for being a pioneer of community arts, experiential education, sustainable urban agriculture and for demonstrating innovative and achievable solutions to pressing environmental and social issues. CERES has been in existence 25 years and employs 200 people (equivalent to 60 full time positions). It is an incorporated not for profit organisation governed by a Committee of Management. CERES has been created for community by community and is an available model for communities all over the world. 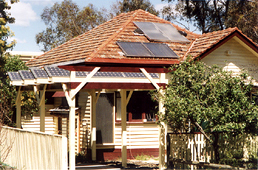 CERES hosts numerous practical community projects for sustainable living, including the CERES EcoHouse demonstration home and the [[CERES electric car project], and a bicycle workshop. A range of independently managed site groups and volunteers which enrich the community landscape and provide diverse opportunities for participation. The overall aim is to teach and inspire – creating a rich tapestry of experience, as well as services to the community and income to support further CERES projects. This page was last modified 02:05, 21 March 2009.